McCarthy performed the first human mandibular distraction in 1992, using an external distractor in patients with hemifacial microsomia. This signaled the beginning of successful applications of DO in the maxillofacial region. Its use in the maxillofacial region has been reported by several authors, such as in the reconstruction of segmental defects and alveolar bone augmentation. However, few have reported its use in the treatment of condylar aplasia, which itself is a rare occurrence. 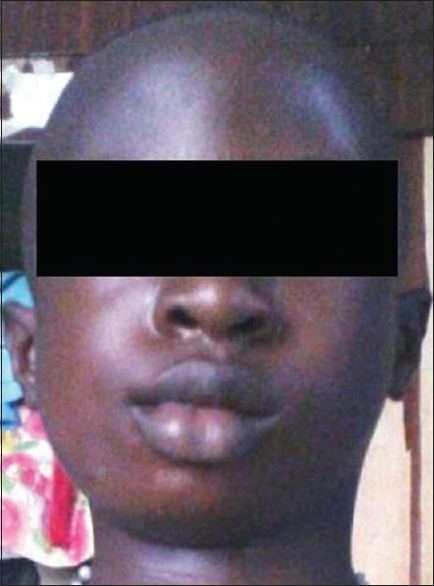 We present a case of a 10-year-old male with nonsyndromic, right condylar aplasia complicated by mandibular growth deficiency and resultant asymmetry. The asymmetry was successfully managed with the use of DO. 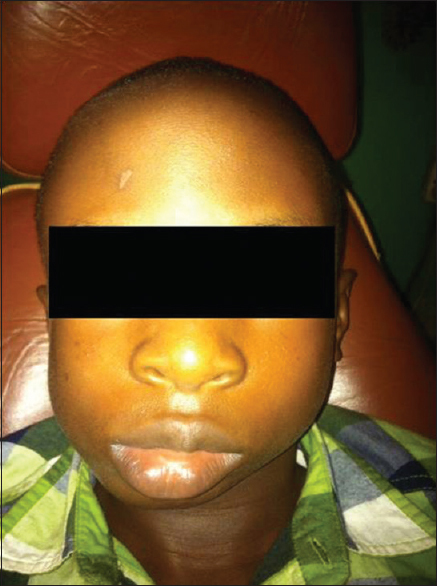 A 10-year-old male presented with a complaint of facial asymmetry and consequent poor esthetics of 5 years' duration. There was no previous history of trauma, childhood illness, ear infection, or forceps delivery. Clinical examination revealed obvious facial asymmetry with deviation of the mandible and the chin to the right side. The left side of the face was flat and elongated, while the right side was full and appears shorter than the left [Figure 1]. The temporomandibular joint (TMJ) movement was palpable on the left only. 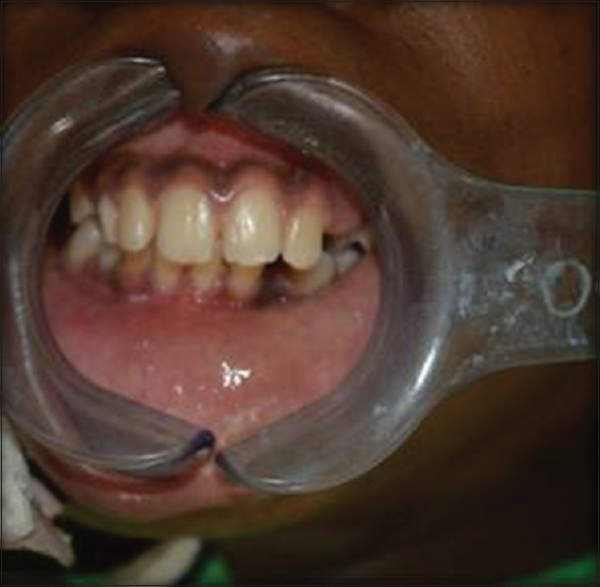 Intraoral examination revealed a midline shift of the occlusion to the right side by about 4 mm [Figure 2]. A three-dimensional reconstruction and computerized tomography of the face and the mandible revealed right condylar aplasia and absence of the glenoid fossa, ipsilateral prominent antegonial notch, and a mandibular deviation to the right [Figure 3] and [Figure 4]. 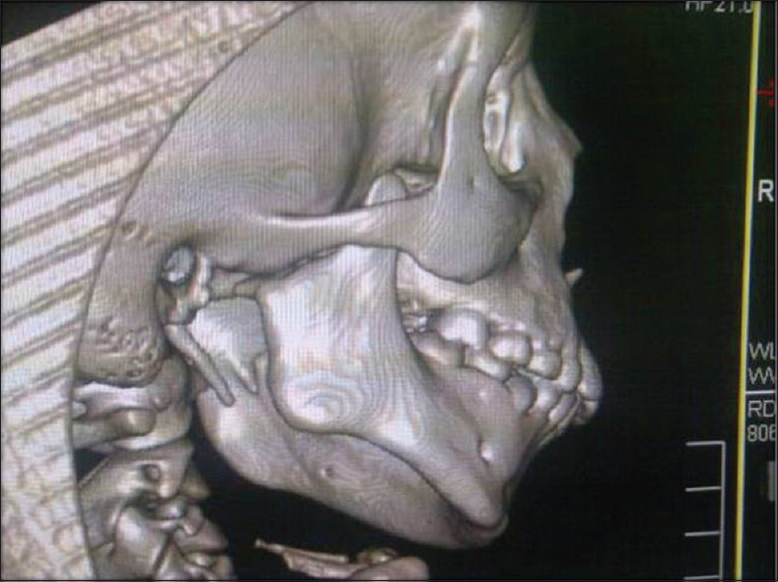 A diagnosis of condylar aplasia was made, and DO of the right mandible was planned. An extraoral submandibular approach for placement of the DO device under general anesthesia was selected. Airway was maintained through the orotracheal approach. Antibiotic prophylaxis was administered (1 g of ceftriaxone) through the intravenous route. Routine scrubbing and draping were done. A 5-cm surface marking for the proposed submandibular incision was made, and 5 ml of 1:200,000 adrenaline solutions was infiltrated along the marking. Thereafter, a standard submandibular incision measuring about 5.5 cm was made and deepened using blunt dissection till the mandible and its periosteal covering were visible. A longitudinal periosteal incision was made, and the periosteum was then elevated carefully using a sharp Howarth's periosteal elevator. A marker was used to define the intended corticotomy, the longitudinal axis of the distraction device, and the screw holes as determined preoperatively. 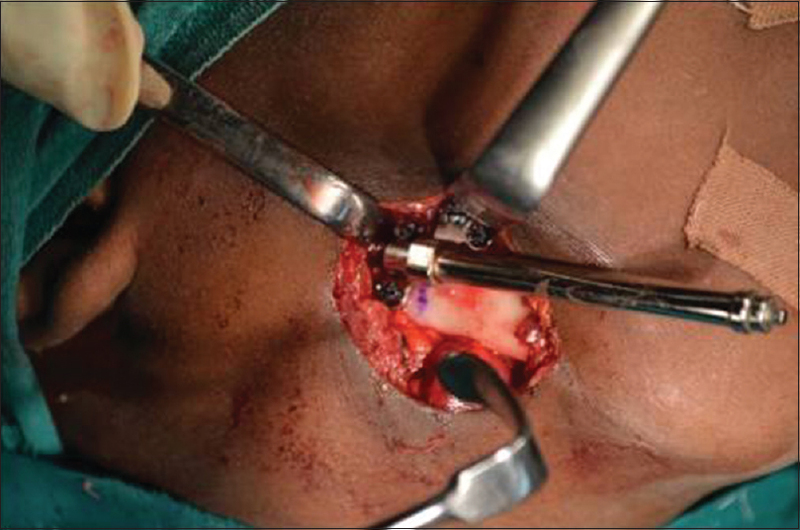 A single continuous, circumferential osteotomy cut was made just distal to the ipsilateral first permanent molar using fissure burs and osteotome [Figure 5]. The device was then fixed to the mandible using three monocortical screws on either side of the osteotomy cut [Figure 6]. The distractor was tested intraoperatively by distracting for 2 mm and found to produce satisfactory movement of the mandibular segments. The device was then deactivated, by reapproximating the mandibular bony segments. Subsequently, suturing was done in layers with the skin closed primarily using wound adhesive (cyanoacrylate). A latency period of 3 days was allowed. Distraction was done at a rate of 0.5 mm/day in two sessions for 8 days by which time the midline shift was largely corrected. The patient spent a total of 6 days on hospital admission postsurgery and had six separate activations of the DO device done, three of which were done by the parent under close supervision by the surgeon before discharge. Further activations of the device were done by the parent on outpatient basis with strict instructions to make a quarter turn in the morning and another quarter turn in the evening. To allow adequate monitoring, one of the two daily activations was done under supervision at the hospital, every other day. A consolidation phase of 6 weeks was then instituted with instructions that patient should be on soft diet. Postoperative orthopantomogram was taken to evaluate the procedure. After the consolidation period, removal of the distractor was done through an incision placed along the preexisting surgical scar under general anesthesia. The patient was given 2-weekly appointments for the 1st month after removal of device and is now being seen monthly for review. The extraoral wound healed satisfactorily with minimal scaring. No complications were observed. There was no clinical evidence of infection during the distraction and consolidation period. The patient was evaluated using serial orthopantomogram during the postoperative period. Satisfactory correction of facial asymmetry, mandibular occlusal midline, and improvement in mouth opening to about 3 cm was achieved [Figure 7] and [Figure 8]. The patient has been followed up for 6 months with no untoward effect of the surgery or relapse observed. Downward and forward growth of the affected side is impaired, resulting in significant esthetic challenges. The cheek appears full on the affected side, and the mandible deviates to the affected side. Furthermore, there may be an occlusal cant, mandibular retrognathia, as well as a shortened ramus height with resultant facial asymmetry. The TMJ develops from the temporal and condylar blastema, which begins to develop around the 8th week of intrauterine life. The right condylar fossa was shallow in this case, which indicates that this defect may have been present prenatally. There was no history of traumatic birth delivery. Several options for management of this condition have been proposed, including DO, use of functional appliances, surgical osteotomies, and surgical reconstruction of the joint with the use of costochondral graft. In this case report, DO was opted for because of its availability, ease of use, and existing expertise. Functional appliances such as the KLAMPT appliance have also been found quite useful for the treatment of condylar aplasia in growing patients. However, functional appliances require the cooperation of the patient; it may also require a long period of treatment and relies heavily on growth spurts. Costochondral grafts on the other hand offer the possibility of growth and subsequent correction of the facial asymmetry; however, they may be rejected, and growth in them may be unpredictable as it grows at another rhythm compared to the condyle., Furthermore, the absence of a well-defined glenoid fossa which is required for articulation may complicate its use. Presurgical orthodontics was done to decompensate for occlusal adaptations. A linear DO device was used. DO offers an effective alternative. It stimulates both hard- and soft-tissue growth. It was secured with monocortical screws so as to avoid developing tooth buds of the molars. Notably, a multiplanar DO device would have been preferred; however, due to financial incapacitation and limitation in resources, a uniplanar DO device was used. The multiplanar DO device offers multidirectional distraction of the bony segments, which would have been useful in this case where both horizontal and vertical deficiencies were identified. Notwithstanding the facial asymmetry which was largely corrected by the uniplanar device used, the vertical deficiency remained uncorrected. The TMJ was also not reconstructed because of financial incapacitation. Focus was on addressing the patient's main complaint, which was the facial asymmetry. Correction of the horizontal deficiency was sufficient to address this. Therefore, lengthening of the right body of the mandible and increment of the ramus height were planned for and achieved by placing the DO device about 4 mm from the right angle of the mandible and ensuring that the resultant force had both a vertical component and a horizontal component. Hence, the facial asymmetry, which was the primary complaint of the patient, was corrected. This case report has demonstrated effective use of DO in correcting the untoward effects of condylar agenesis. We were able to correct the midline shift and improve the mouth opening of the patient. Joshi SS, Sande AR, Sunil MK, Suragimath A. Unilateral condylar aplasia: A case report. J Indian Acad Oral Med Radiol2015;27:445. Singh AI, Singh PM, Dey N, Singh NS. Condylar aplasia with contralateral temporomandibular joint ankylosis. J Med Soci 2014;28:57. Wright EF, Flaggert JJ. Acquired condylar hypoplasia: Case report. Paediatr Dent 1993;15:427-8. Yang L, Suzuki EY, Suzuki B. Biomechanical comparison of two intraoperative mobilization techniques for maxillary distraction osteogenesis: Down-fracture versus non-down-fracture. Ann Maxillofac Surg 2014;4:162-70. Thur A, Bagatin M. Distraction osteogenesis. Acta Stomatol Croat 2002;36:103-5. Hegab AF, Shuman MA. Distraction osteogenesis of the maxillofacial skeleton: Biomechanics and clinical implications. Sci Rep 2012;1:1-2. Franco J, Carstens M. Mandibular distraction in infancy. Oper Tech Otolaryngol Head Neck Surg 2009;20:241-4. Fritz MA, Sidman JD. Distraction osteogenesis of the mandible. Curr Opin Otolaryngol Head Neck Surg 2004;12:513-8. Asaduzzaman M, Rahman QB, Aziz S, Sikder MA, Akhter M. Mandibular deformity correction by distraction osteogenesis. Bangabandhu Sheikh Mujib Med Univ J 2010;3:103-6. McCarthy JG. The role of distraction osteogenesis in the reconstruction of the mandible in unilateral craniofacial microsomia. Clin Plast Surg 1994;21:625-31. Nuntanaranont T. Distraction osteogenesis: Role and clinical applications in the maxillofacial region. Ann R Australas Coll Dent Surg 2008;19:125-32. Rachmiel A, Aizenbud D, Eleftheriou S, Peled M, Laufer D. Extraoral vs. Intraoral distraction osteogenesis in the treatment of hemifacial microsomia. Ann Plast Surg 2000;45:386-94. 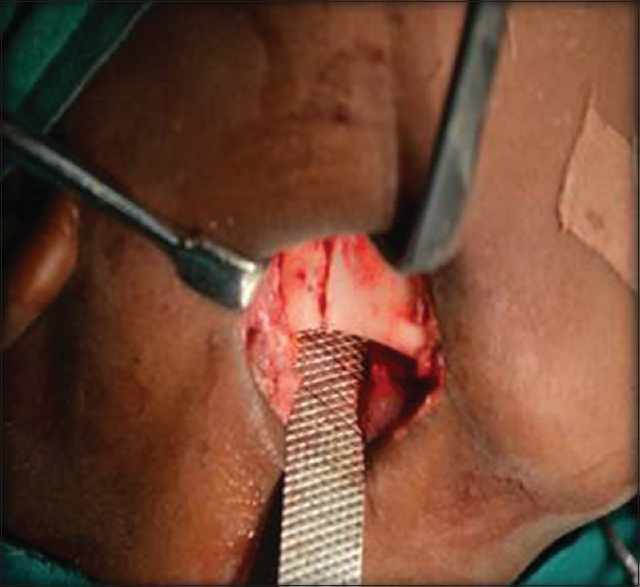 Arun T, Kayhan F, Kiziltan M. Treatment of condylar hypoplasia with distraction osteogenesis: A case report. Angle Orthod 2002;72:371-6. Agrawal S, Singh S, Agrawal M, Singh S. Unilateral hypoplasia of the mandibular condyle or dysplasia – A unusual case report. Int J Contemp Dent2012;2:6. Kido Y, Gordon CT, Sakazume S, Ben Bdira E, Dattani M, Wilson LC, et al. Further characterization of atypical features in auriculocondylar syndrome caused by recessive PLCB4 mutations. Am J Med Genet A 2013;161A: 2339-46. Mauricio MG, Omar RY. 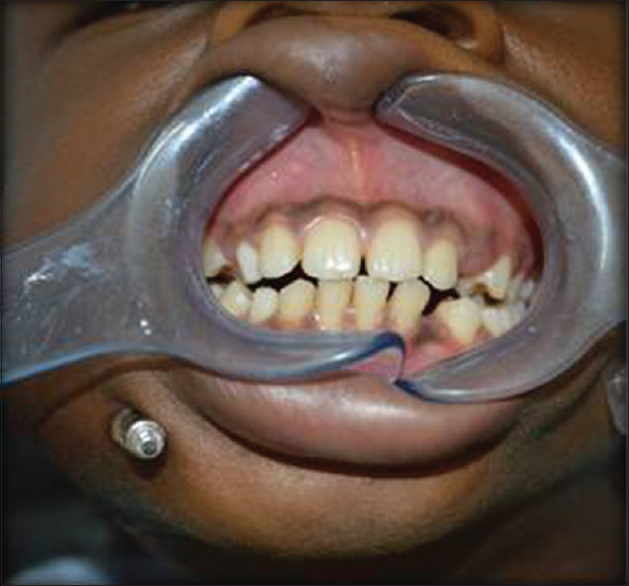 Mandibular condylar aplasia treated with a functional approach. J Clin Pediatr Dent 2013;38:179-84. Guyuron B, Lasa CI Jr. Unpredictable growth pattern of costochondral graft. Plast Reconstr Surg 1992;90:880-6. 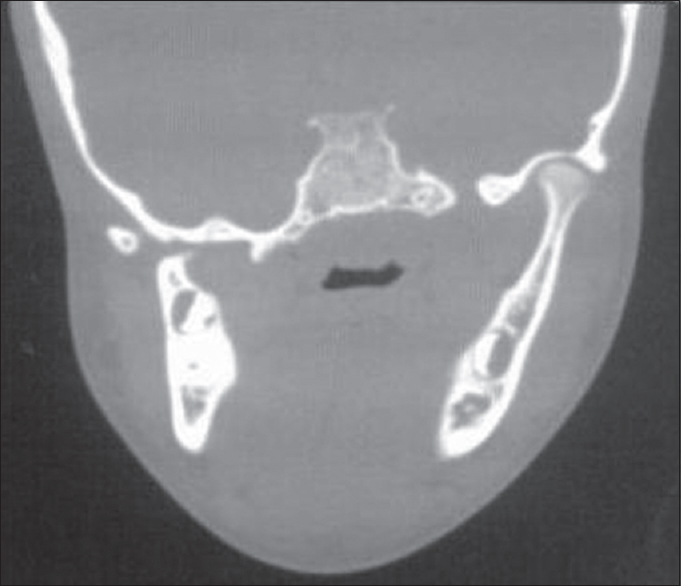 Verma A, Yadav S, Singh V. Overgrowth of costochondral graft in temporomandibular joint ankylosis: An unusual case. Natl J Maxillofac Surg 2011;2:172-4.